MATHCOUNTS is a national math enrichment, coaching & competition program that promotes middle school mathematics achievement in every U.S. state & territory. For more than 30 years MATHCOUNTS has been one of the most successful education partnerships involving volunteers, educators, industry sponsors & students. 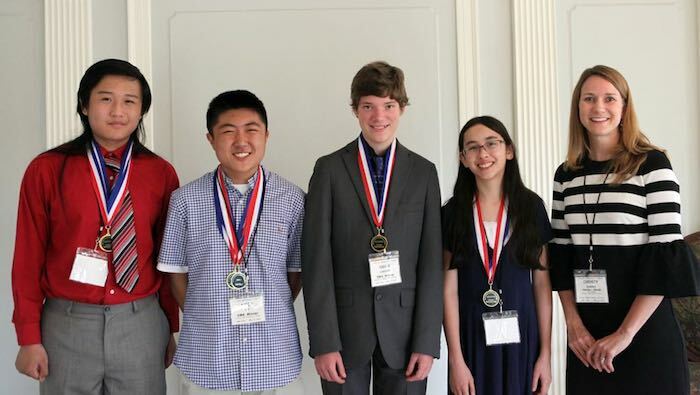 The MATHCOUNTS mission: To increase interest and involvement in mathematics among all middle school students in order to assist in developing a technically literate population essential to U.S. global competitiveness and the quality of life. How does the MATHCOUNTS program work? In Colorado, the program is made possible by the National Society of Professional Engineers–Colorado (NSPE-CO). Schools register with MATHCOUNTS and receive coaching and testing materials and begin in September preparing for regional competition that is held in February. What are the topics covered and are they really appropriate for seventh and eighth graders? Topics include algebra, probability, approximation, geometry, and statistics. Problems fit in 6th, 7th, and 8th grade curriculums across the country. Problems are designed to accelerate students’ interest and achievement in mathematics.